I've decided to reflect each week by joining I with the My Sunday Photo project. The last seven days have been pretty hectic: Wilf celebrated his 4th birthday; we received the children's school reports; Ossie is practicing his new-found skill of walking; and Elliot performed with the school choir at the local Flower Festival. 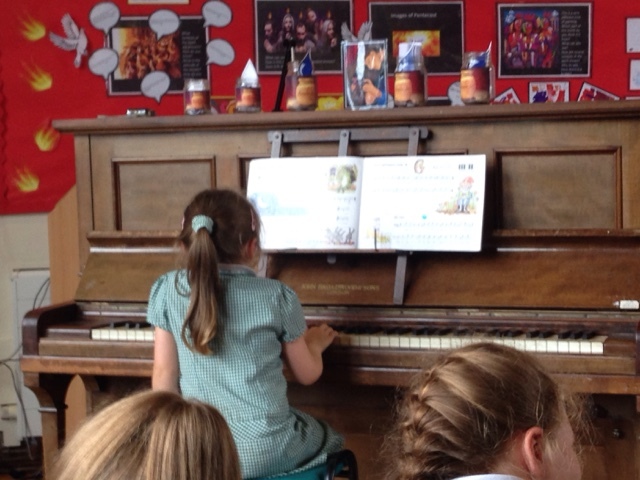 On Wednesday we went up to school for the annual music concert. Both Elliot and Beatrix are learning to play the piano and this was Bea's first public recital. At home she sings along when she practices, but when she stepped up to the front, she suddenly became a little over-awed by the occasion. Despite her nerves, she just sat down and played her piece (without singing along) and the practicing paid off - she was flawless. I was so proud of her. She was the youngest performer and she really stepped up to the mark, overcame her fears and just got on with it - I'm sure I could learn a lesson from that!